To make integrating your own forms as pain-free as possible, the process is split into six discrete steps. Each step needs to be completed to successfully add a form for storage by Form Tools. If you are unable to finish setting up the form in one sitting, no problem! The values you've entered for each page are stored in memory so you can pick up where you left off. To keep things simple, the Add Form process only shows a subset of all the available options: things like setting up email notifications and Views can be set after the form has been successfully added. There's plenty of information on those steps elsewhere in the documentation. To add an External form, just select the External form on the main Add form page. That will open a dialog like the screenshot to the right. 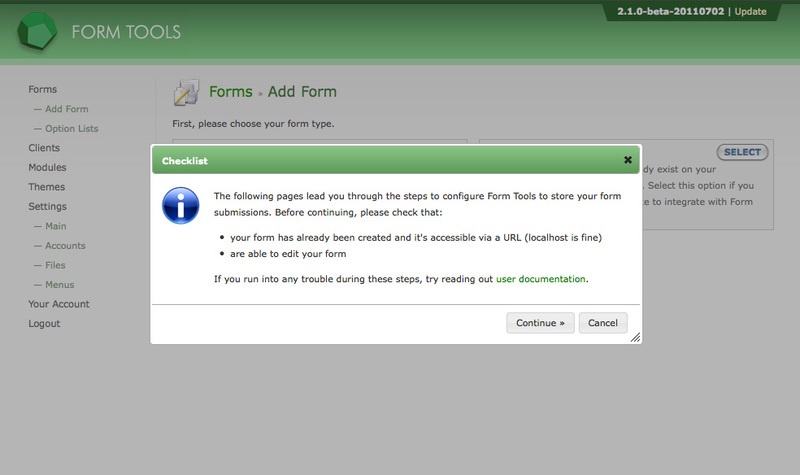 It's a checklist to confirm that you will be able to configure your form. You must be able to edit your form and that it is accessible via a URL. In addition to the following pages in this documentation section, you might also be interested in these tutorials - they explain how to add your forms with more step-by-step instructions. The next step is to choose a submission method: process.php or API. Go to the next page to see a comparison between the two methods.